You may already know that you’re a creative spirit, with an appetite for life’s many passions. But when was the last time you branched out in the ways that you celebrate these gifts? 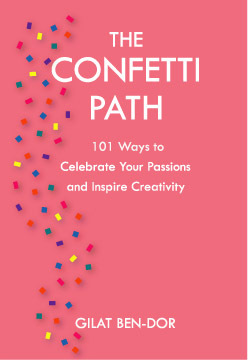 Gilat Ben-Dor’s THE CONFETTI PATH reveals 101 diverse ways to savor the beauty around you and ignite the spark of inspiration in everyday situations. Signed edition. If you have many passions, then you likely have the natural curiosity, energy, and drive to explore them. Now it becomes a matter of staying on track. But how? 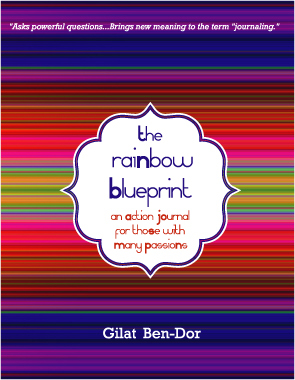 More than a pretty “blank book” journal, The Rainbow Blueprint Action Journal by Gilat Ben-Dor offers you a guided space to plan, execute, and reflect on the way that you live, in the context of your passions. With provocative questions and accountability check points along the way, you are able to centralize your thoughts, prepare an action plan, and reflect on the ultimate questions: Are you truly living the life you’ve envisioned? Are your multiple passions being adequately incorporated into your life? If the answer is yes, then enjoy your joyous reality. If the answer is not yet, then The Rainbow Blueprint Action Journal is sure to open new doors to you. Signed edition.